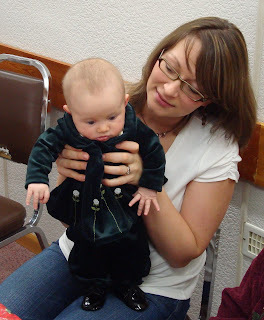 We've been away for awhile visiting my family in Hanna. Brad was at a hockey tournament, so Gracie and I went to Hanna for a few days. Mom came up to Edmonton on Monday and we spent a few days shopping and visiting and then she brought me back to the farm, so Brad could come out after his tournie and we didn't have to have two vehicles in Hanna. We spent all day Tuesday at the mall and Gracie was so great! We shopped from 10 to 4 or so and she just rolled along in her stroller and slept or watched all the people and Christmas decorations go by. I almost got my whole list done in a day! Yippee!! Then, in Hanna, mom and I scrapbooked, Curtis, Brandi and Jada came out to visit, and we all visited and played scrabble and card games all weekend. 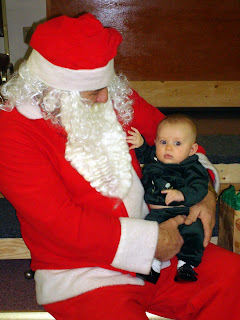 Brad got there Friday afternoon and we went to a Christmas party where Gracie saw Santa for the first time! It was such a great weekend! Gracie's first gift from Santa was this great mirror. She loves to look at the 'other baby' in it and it helps me keep her looking to the right. Can you see her little bald patch? What a cutie. Looks like I took a razor to her hair, but it's just rubbed off from laying on her back. 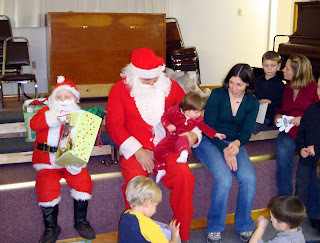 Santa did such a good job with all the little kids, too. Everyone loved seeing him, especially since he's so busy this time of year. 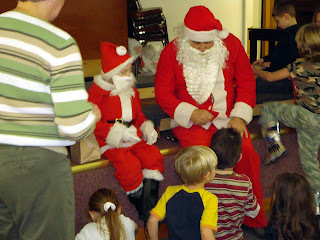 And, a little mini me Santa showed up, too! Thanks Auntie Linda for the cute Christmas outfit! Gracie looked so great and was mesmerized by her shiny shoes. 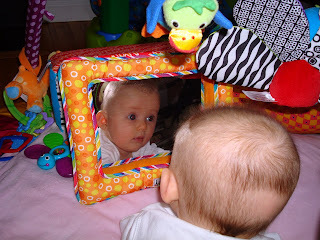 I love th picture of Gracie and her mirror. I got some pics from the weekend printed today. So cute.